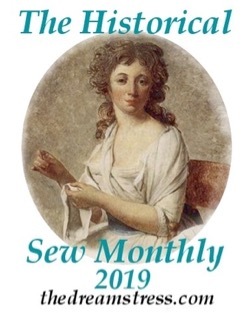 Since it will be a new year, the second Historical Sew Fortnightly challenge of 2014 (due Sat Feb 1) will be all about new things: Innovations. Innovation is one of the biggest drivers in new fashions, today, and in the past. New inventions, the introduction of new materials or new styles from abroad all create new trends. Some of these fashions faded quickly, others had a lasting impact on what we wore. To celebrate the way inventions, introductions and discoveries have impacted fashion, make an item that reflects the newest innovations in your era. 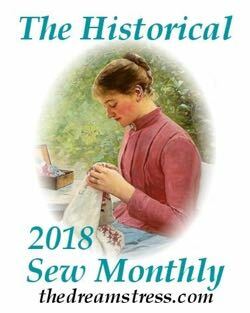 Because the Historical Sew Fortnightly is about learning as well as creation, I’d really encourage you to share the research you did into your innovation when you present the finished item. 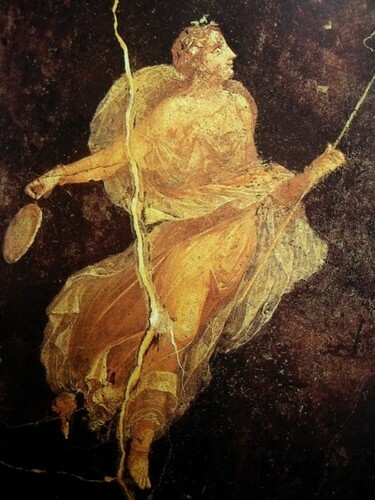 There have been innovations in fabric that have changed fashion, like the introduction of Chinese silks into ancient Rome (much to the distress of Roman officials, who worried about the economic impact of all that Roman gold going East to pay for the silk coming West – to the point where they even hired notable authors and playwrights to write anti-silk propaganda). 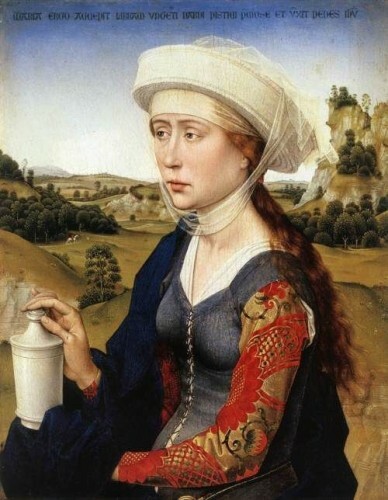 Eastern silks created fashion waves again in the Middle Ages, as Chinese & Ottoman brocades & velvets made their way to Northern Europe, revolutionising elite fashions in the late Middle Ages & early Renaissance. 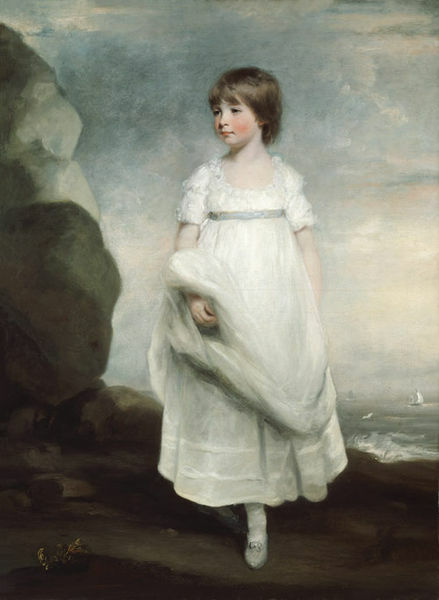 In the 18th century, it was cotton and not silk that revolutionised fashions, helping to bring in the softer, more relaxed look of Neoclassical fashions. 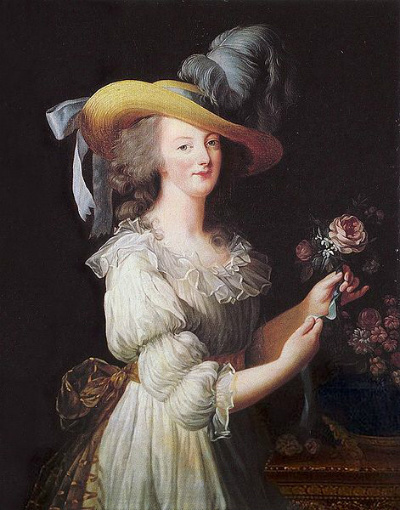 Cotton made garments like Marie Antoinettes infamous chemise a la reine possible. 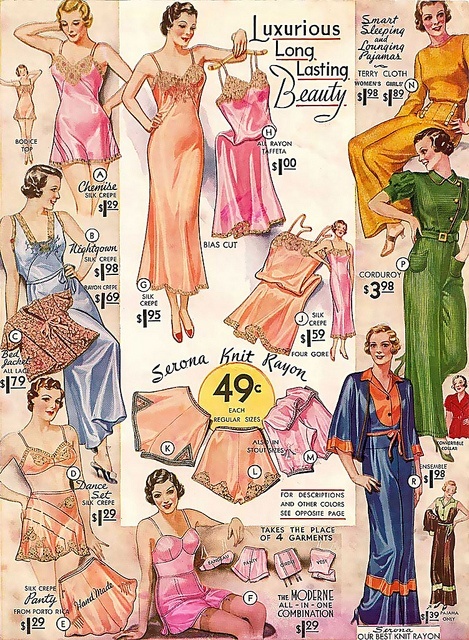 More recently, the development of cellulose-based rayons provided a cheap alternative to silks, and paved the way for the first full-synthetic fabrics, like nylon. While we mostly associate early rayons with the ’30s and ’40s, it was actually available for sale in New Zealand (and the rest of the Western world) from 1912. Innovations in dye have also drastically changed fashions. While indigo dye was known in Europe from ancient times, and woad, which produced indigo dye (but in much smaller quantities than from the indigofera plants) was grown commercially as a dyestuff throughout the Middle Ages, the introduction of large quantities of indigo dye from India by Portuguese explorers in the early 16th century revolutionised the amount and depth of the blue colours that could be achieved with dye. Other Western powers, wanting their own share of indigo, soon set up plantations in the West Indies and the American South. 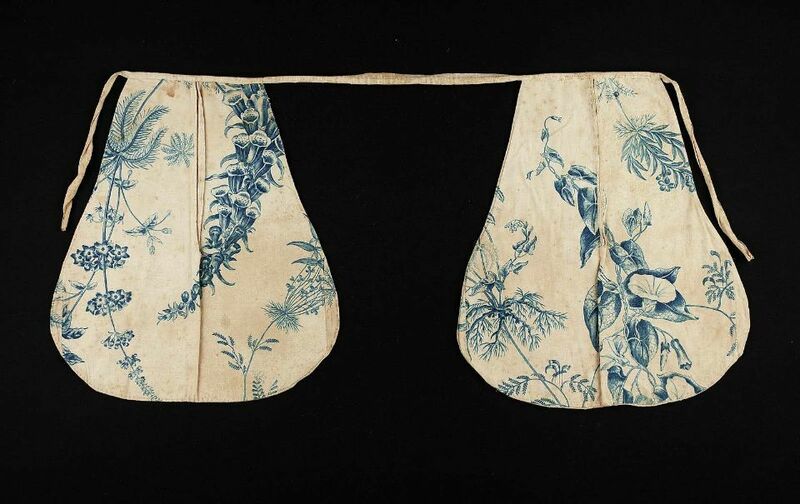 Despite bans on indigo imposed to protect the woad dyers, everyone wanted the new dye, especially as it combined with the new cotton fabric to create the classic blue and white toile de jouy and calico prints. Toile de jouy also owes its characteristic delicate details to another new innovation: engraved printing on fabric. Indigo, combined with logwood which was imported from Central America & the Caribbean from the 1570s dyed fabric a rich, dark black which did not fade or destroy the fabric it was dyed into like earlier black dyes had done (you can see how the black threads of this jacket, dyed during an English ban on logwood black, are literally being eaten away). The fashion for the newly effective, and considerable cheaper, though still very expensive, black fabric is reflected in early 17th century fashions (and again at the end of the 17th century, when bans against it in England and other countries were lifted), and in the dress of the Puritans (who would think that the dress of a group who have come to epitomise severity actually dressed based on a fashion for the newest dye?). Without the addition of indigo, logwood dye faded to orange in a few short weeks, and without logwood, indigo could not dye black. Most famously, of dye innovations, aniline dyes completely revolutionised the dye industry in the 1860s, ushering in a range of glaring brights, and eventually almost completely replacing natural dyes. Not just colour, but an absence of it, (or, technically speaking, a combination of all of it) was also an innovation. Before the early 1800s bleaching was a time consuming, and rather nasty, process which involved stale urine and fabric spread out over ‘bleaching fields’ and left to sun-whiten for month. The work of scientists and inventors such as Carl Wilhelm Scheele, Claude Berthollete, and Charles Tennant led to the development of chlorine and its combination with line, resulting in a ‘bleaching powder’ that bleached fabric white in a matter of hours or days. 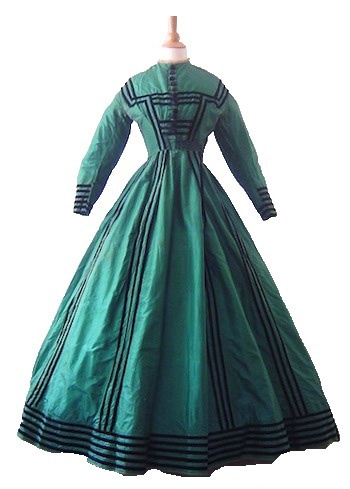 All of this made the Neoclassical fashion for white frocks accessible to a wide range of social levels, and made elaborate Victorian patterned fabrics possible. Bleach is an innovation that still affects fashion today, but other innovations have become less relevant with the change in fashions. 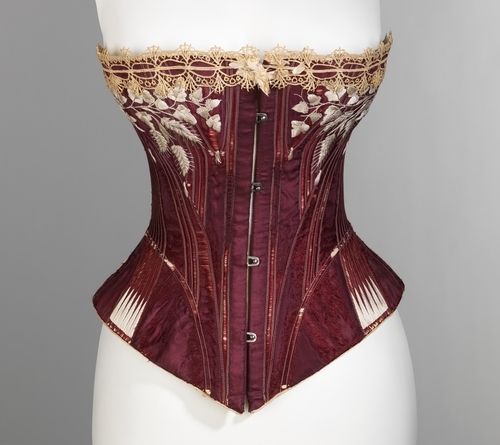 Corsets now sit on the periphery of fashion, but the introduction of front-fastening slot & stud busks in the mid-19th century (there isn’t an exact date, but they were definitely in use by 1850) made it possible for every woman, even a factory worker who lived alone, to lace herself into a corset everyday, and corset-wearing became nearly universal as a result. 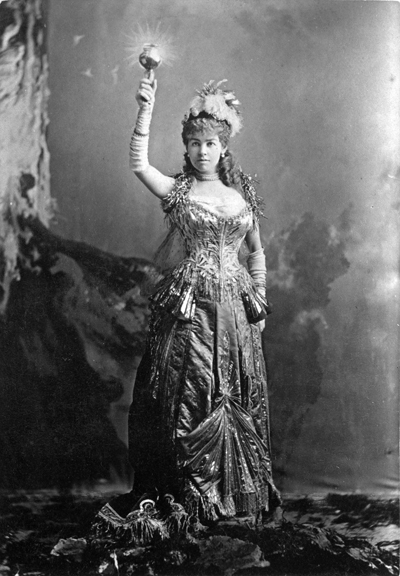 And, as long as inventors were making it possible for every woman to wear a corset, they also made it possible for every woman to really cinch herself in: metal eyelets were invented in the mid-1820s, and made it possible to lace corsets more tightly, as well as speeding up the manufacture of corsets. The invention of steel corset bones is perhaps more relevant today. They were originally created to replace more expensive whalebone, but with the over-hunting of whales and subsequent bans on whaling, they have replaced them for reasons of ethics rather than cost. These are just a few of the innovations that changed fashion that I can think of off the top of my head: I’m sure there are literally thousands more. Go forth, research, sew, create, and I can’t wait to see what you make, and the information you find to share! I think front opening busks are actually still relevant today, even if corsetry itself is less so. When I did my searches for busk (in an attempt to figure out what it could be called in Czech, I believe), I mostly ran into the front-opening ones. In fact, that problem I have with “busk” in Czech is that I could only find a term that refers specifically to the opening (closing, technically) and not the support function of earlier busks. … and I’ve got it! The steel boning also benefited a lot from the innovations in steel quality that came in the 19th century, and quite a lot from Swedish steel mills. Two inventions that pop into my head, and that I’ve used quite a lot, is of course the sewing machine and the jacquard loom, or at least I’ve used quite a lot of jacquard fabrics. Yes, I saw some pictures of jacquard looms recently. They are fascinating. 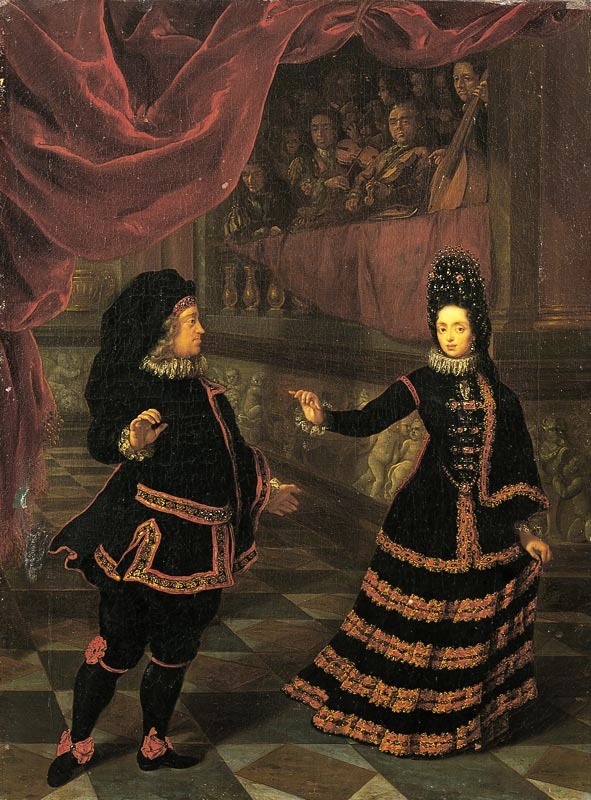 Do the costumes themselves have to be made from innovative materials or with innovative techniques, or do dresses like this one count? I’m not making the electric light costume, I’m just wondering. Oooh, that comics! Awww, and other related expletives! Thank you for the fascinating post. I wonder if you (or the other readers) might have an answer to a question I’ve had for quite some time: how quickly did the old-fashioned methods of dyeing black result in decay of the fabric/thread? Is this something only seen in museum pieces, or are there records that indicate it would occur within the fabric’s normal working lifespan? This is an interesting concept for an HSF challenge. I look forward also to see what will come of it. I think zippers and elastic are pretty notable innovations. I find old movies featuring buttons all over clothing pretty amusing. Button back dresses by necessity? No thanks! The Marie Antoinette pic reminded me about something that I like to spread the word about to other sewers: if you are looking for an inexpensive source of fine, handkerchief weight cotton fabric, and you have an Indian sari fabric store anywhere accessible, then try going in and asking them for “turban material”. I have known about this for a while, but back in the day the colour palette was fairly limited to white, dark and light blue, pale pink (yes! ), pale yellow,and cream. These days, I went to buy some and saw that the palette had expanded exponentially and just about any colour you could want was there! It is a pure cotton that “broomstick-pleats” very well, and is not particularly sheer, though I did encounter an amazing ‘cotton chiffon” at one point that was almost impossible to sew because it was so fine and light it was as difficult to manage as silk chiffon! Most people don’t realize that India is/was famous for its fine cottons! There is an apocryphal story of an Indian princess who appeared at court in a garment consisting of SEVEN layers of this legendary fine cotton fabric and STILL got scolded by her father the king for her immodesty! Challenge done and blogged about. 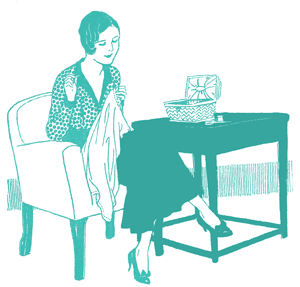 My innovation was published knitting patterns and I knitted a knee warmer from 1838. Done! 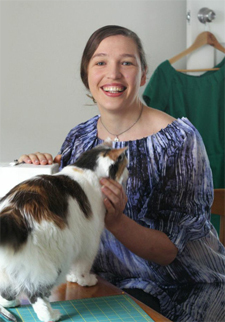 I made pattern 27 from Betty Kirke’s book on Madeleine Vionnet. On grain to bias joins and interesting cutting layouts! More pictures (modeled, not mannequined) to come soon! I posted about the influence ladies’ periodicals had on how fashion was spread and the early days of the printed pattern. Things didn’t quite turn out as expected, but I managed to pull things together in time. see if this link works…..
Nope 🙁 And the link through your name isn’t working either. Ugh. I will figure this out….. thanks. Squeezing in at the last minute with a net regency dress. I published a blog post on the innovation of knit fabric, referencing to the inventions of rayon, modal, and polyester. My project takes a modern dress and refashions it into an authentic 1920’s “Bertha” collar (also called shawl or capelet collar) dress. My combination undergarment for Victorian costuming! I made a ‘Quaker’ bonnet, which I finished on time, but couldn’t post till now. A few days late, as the write up took a while, I present the Netherlandish (Flemish) white hood, which first debuted in 1490, and was the precursor of the iconic Dutch regional headwear. This has been on the drawing board for years. I’m so glad this challenge finally drove me to get it made, and to play with starch. Hello! I just had a chance to post. I made up a side saddle riding apron, which was an innovation in safety in the early 20th century. I have not finished the project that I intended for this challenge. I will get it done for the UFO challenge. But since the next two projects are related to it I thought that I would post this much.